Last week, I wrote a post on how to avoid paying outrageous data roaming charges on your cell phone bill. This week, I'm writing about how to avoid spending a ridiculous amount of money for wifi Internet access in hotel rooms. In fact, many high-end hotels charge a lot of money for wifi Internet access (it can be up to 30 euros per day in France). An easy way to circumvent that problem is to subscribe to a 3G Internet access plan using either a 3G USB key or a portable 3G wifi router such as the famous Mifi router or a Huawei router for instance. Portable 3G wifi routers have the advantage of creating a mobile hotsport everywhere you go and allowing usually up to 5 devices to connect to them at the same time. This can be handy if you're planning on using multiple computers or a computer and an iPad or even an iPhone. Subscribing to such a service in your home country can save you a lot of money. But it gets even better when you're abroad as many carriers now offer prepaid data plans. So, for a little bit more than what you would pay for a device + plan at home, you can get a 3G USB key and a month of relatively unlimited data (from 2 to 6 Gb depending on the country) for usually less than USD150 with no contract or commitment. When you do the math, it's a lot cheaper than paying for in-room wifi Internet access if you're gonna stay in a hotel for more than a week. I tested this myself last year on a 3-week trip to Australia where for less than AU$ 250, I purchased a Telstra USB key with 6Gb of data for 30 days. This saved me a lot of money and worked in remote areas where hotels had lousy dial-up Internet access but great 3G reception! An even smarter thing to do is to use an old unlocked iPhone 3G (or buy one on eBay). After jailbreaking it and purchasing the MyWy Jailbroken application for USD 19.99, you'll be able to use your phone as a Mifi router. 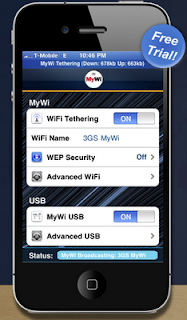 Hence, you'll be able to use any iPhone compatible prepaid data plan with your computer(s), iPad(s) and even other iPhone(s) by using this jailbroken iPhone 3G as a mobile wifi Hotpsot. Be sure to pack extra batteries as intensive use can drain the iPhone battery in 2 to 3 hours. Nevertheless, this solution totally rocks! Be sure to check if the carrier you plan on using allows such use beforehand though.